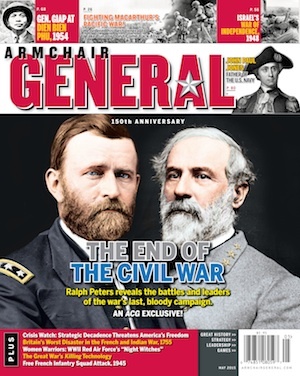 Ultimate General: Gettysburg – PC Game Review | Armchair General Magazine - We Put YOU in Command! Ultimate General: Gettysburg. PC game review. Publisher: Game-Labs. $14.99. Passed Inspection: Intuitive, fast-paced action. Easy to learn. Dynamic campaign. Pretty terrain. Failed Basic: Clunky interface. Poor communication of new events. Battles devolve into melees. Ultimate General: Gettysburg attempts to model the Civil War’s most dramatic and complex battle. It is a spiritual successor to the classic Sid Meier’s Gettysburg. It updates Gettysburg with a 3D engine and modern graphics, but doesn’t fill the original’s brogans. Sid Meier’s Gettysburg is a classic of the strategy and wargaming genre. It brought real-time strategy and an intuitive interface to a battle that had previously only been the subject of stodgy, turn-based hex wargames. With its dynamic campaign and random battle modes, it was endlessly playable—no other Civil War game has come close, with the possible exception of Scourge of War: Gettysburg. Ultimate General: Gettysburg is essentially Sid Meier’s Gettysburg in 3D. It follows the same dynamic campaign and uses very similar mechanics. The primary difference, besides graphics, is that your units can only be controlled down to the brigade level instead of individual regiments as they were in SM Gettysburg. UG’s interface is intuitive but unsophisticated—just click and drag to set movement paths; arrows appear along the path as you drag. In a step back from the decades old SM Gettysburg, you cannot control units by division or set formations; you must either set individual brigade paths or be content with having a whole bunch of your brigades move together maintaining the same spacing. Likewise, there’s no way to force a brigade from line into column and vice versa. They seem to automatically change formation when within a certain distance from the enemy. The biggest irritation with Ultimate General is the lack of player feedback and alerts. Your brigades will break and run with no warning, unless you’ve been periodically clicking on them to check their morale. Even worse, sometimes a unit will break and run and you won’t even notice until you move over to that side of the map. A little audio alert or popup announcing, “Gordon’s brigade is routing!” or “The Iron Brigade is about to retreat!” would be very handy. Likewise, when the game does give you an alert for newly arriving reinforcements, the reinforcements aren’t actually there yet. You can click on the alert to take you to where they will enter the map, but you have to actually wait around before they actually appear on the map. It’s just sloppy. Finally, there’s little in the way of subtlety in battles. Because coordinating your forces is so difficult, your attacks will mostly be blobs of brigades charging into battle. To put salt in the wound, with your brigades in close proximity the interface makes it very hard to see which one is which as they all get muddled together. The good news, such as it is, is that UG maintains several of the features that made Sid Meier’s Gettysburg so groundbreaking—the customizable AI and the dynamic campaign. Instead of a simple linear progression from hard to easy, you can customize the AI’s aggression and skill level. You can face anything from a cautious, Ambrose Burnside–like bumbler to an AI that is as aggressively opportunistic as U.S. Grant. The dynamic campaign means that you can reenact an alternate version of Gettysburg. Your actions in the early meeting engagements radically affect the sort of battles you face on the second and third days, as the Union and Confederacy lose and gain key hills and ridgelines. It’s just unfortunate that the only things the game does well have already been done—back in 1997. It’s not that Ultimate General is a bad game; it’s fun for a while and probably the most accessible treatment of Civil War combat playable on a modern PC. It’s just disappointing and unpolished and doesn’t expand on the legacy of its classic ancestor. Ultimate General feels like an unfinished fan remake of a much better game. If you really need your Civil War fix, give Scourge of War a look. Matt Richardson is a freelance social media consultant and copy writer in Charlotte, North Carolina. He has a degree in History from Davidson College, with a special interest in military history and the Civil War. He has rotted his mind with video games since childhood. You can follow Matt at @MT_Richardson and read his blog at Ritalingamer.com. It appears as if it actually takes a less “strategic” view and replaces it with a more historical one; where battles were melees and tactical control was desired but rarely achieved! Historical, yes. Fun play design, no. I’ve been sitting on the fence for this game, waiting for something (or someone) to push me off one way or the other. I may just have to take a plunge on it while it is on sale on Steam. If you’re on the fence, wait for it to be on sale. I’m not saying it’s a bad game – you might enjoy it – it just disappointed me. This review hits the nail on the head. I’m happy to recommend UGG – for twenty dollars, I’ve gotten several hundred hours of multiplayer fun – so I think its well worth the purchase cost. But it is unpolished compared to SMG (not least, I miss the catcalls from the troops asking when we gonna get moving gen’ral?) and the shift to brigade level leaves the combat feeling a bit awkward and unrealistic at times. In many respects it makes me appreciate how much effort and detail Firaxis put into playtesting and building SMG. Still, kudos to Game Labs for making an effort to revitalise the thinking end of the RTS genre. I think your review is strongly biased. You probably like SM Gettysburg so much that you fail to see high quality of a budget game UGG. I have played UGG since its release in early access and have around 200 hours. There are few things that I disagree but I will comment only weaknesses or as you mention it: “The biggest irritation with Ultimate General is the lack of player feedback and alerts.” I think the lack of feedback is a key feature to simulate problems with communication and coordination of 19th century warfare. The information about reinforcements is sufficient enough and adds “realism” since HQ would have received messenger bringing news about reinforcements before it actually arrives. I have never played SM Gettysburg nor Scourge of War, I was not even interested in ACW at all until I played UGG. UGG does not deserve to end up with “It’s not that Ultimate General is a bad game” remark. There is no better ACW game at the moment and I think majority of gamers will not play a game from 90s. I like the people who did this game, and for a while, I was very involved in helping them on a voluntary basis, both as a writer/editor and as somebody who knows a bit about Civil War tactics and formations. I am also a professional game designer, but I was not really involved in discussions with them on that subject. 1) The formations (and the reviewer DID touch upon this) bear little resemblance either to Civil War columns, or Civil War battle lines. Since the designer of this game was very involving in modding many of the Total War games, I am pretty sure having brigades march in columns of four, and deploy into lines two deep, should not have been so difficult to implement. 2) There are units in this game that never existed, and I don’t mean by name. A cavalry “vedette” is four men (usually led by a corporal) on horseback whose job it is to observe. That is why they are called that. There are no 150-man “vedettes,” and mounted cavalry skirmisher do not gallop around the battlefield, overrunning batteries and charging infantry units. Nowhere at Gettysburg did anything like this happen. Or anywhere else that I know of, either, save at Gaines Mill, where a Federal cavalry regiment that charged Confederates from the front got shot out of its saddles. 3) I could go on for a while about other things related to formations (I certainly did with the developers), but instead, I will just add the thing that annoyed me absolutely the most — the field music and sounds. In the game, whenever anybody charges (including infantry), we hear the “Charge” bugle call made famous by Hollywood. This call not only did not come into general use until 1878, it was NEVER used by infantry. There are plenty of great examples on the Internet of Civil War bugle calls, and it would have been easy enough to swap out the existing ones for the right ones. Similarly, fifes and drums, even in 1863, were still in general use, at least at the brigade level (the level of this game). And the Civil war drumbeats for advancing into combat, etc., are exciting and compelling. But what you hear in the game is not only what sounds like kettle drums of some sort, pounding out no drumbeat I have ever heard in my 16 years as a Civil War reenactor, but also, if you listen closely, chanting in an unknown language. Things like this are very easy to fix, too, and in my experience in working on Civil War games in the industry (for Interactive Magic, among others), most Civil War bands of today are more than happy to offer their music to the game in exchange for a credit, and perhaps some sort of nod to them that might generate sales. Darth Mod — the designer of this game — is my alltime favorite modder, and there was a time when I would not play a Total War game, if he had not first made it well. I know that he did not have absolute control over this game, but I still was very disappointed that this “ultimate” Gettysburg wargame ultimately turned out to be nothing of the sort.